This robust software is designed to support multiple CNC machines by continuously monitoring serial ports and facilitating communication right from the shop floor. Not only is the software simple to configure and very visually oriented, it will communicate with every CNC machine in your shop that supports standard RS232 serial communications. The software runs on Windows XP and higher (including Vista) and can be configured for an unlimited number of machines. Machine Link™ Quick Serve monitors each serial port for file requests, and then quickly serves the CNC file directly back to the machine tool control. It runs continuously on a dedicated PC and can serve 32 simultaneous DNC sessions; however, it can monitor many more machines as long as there is a dedicated COM port for the machine tool. 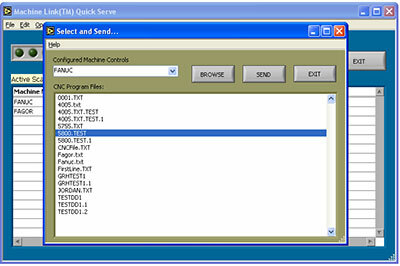 Machine Link™ Quick Serve automates the process of sending and receiving CNC programs – making it easy and convenient! Using simple commands (token or keywords) embedded in the CNC program files, the machine operator never has to leave the machine or manually interact with the PC since the request is initiated directly from the machine tool control at the shop floor level. It supports all standard character sets (ASCII, ISO, and EIA) and will also drip feed most CNC machines. This means no waiting, because each request will be received and processed immediately. There are many hardware options, including wireless communication ports.